And, there is a globalist fetish active today that regards the United States as merely the member on the United Nations roster between the U.K. and Uruguay, resisting assertions of our irreplaceability in the modern world. There. Are we good? Now to the point of the moment: this flap over the “First Man” film depiction of the American flag planted by the Apollo 11 astronauts is one of the great overreactions in recent pop culture history. Having now countered virtually every conservative voice I value, from punditry to elected office, I’ll throw down some additional credentials. When those steps were taken on that unforgettable summer night, I was eleven. As most of America unplugged from the achievements to follow, I stayed glued to grainy TV transmissions from the lunar surface during the five moonwalking missions to follow during the following three years. My path through the radio talk show industry has given me the opportunity to interview many of these American heroes, sometimes in person. But enough about me. Suffice it to say that when I heard the first murmurings of a film version of “First Man,” James Hansen’s 2005 biography of Armstrong, I was thrilled for multiple reasons, chief among them an opportunity for America to revisit one of humanity’s greatest moments, made possible by the energy and initiative of Americans. And therein lies the needless current controversy. Was the Apollo 11 triumph a crowning moment for American achievement specifically, or human achievement broadly? The answer is obviously both, and those facts are not contradictory. While the first footprints on the lunar surface deserve a singular spot on the list of events since the dawn of man, there is no diverting from the fact that it was an American president who mobilized us, American scientists and engineers who made it possible, and American astronauts who achieved it. But wait. Apparently there is something that can attack every vestige of our national pride at this conquest. It apparently withers into globalist smoke if the movie about it does not contain the moment, at 11:41 p.m. Eastern time, when Armstrong and Aldrin deployed the American flag. That moment means everything to me. I wasn’t just a human kid watching that ghostly black and white transmission from the Sea of Tranquility—I was an American kid. And as they planted that flag and took that call from President Nixon and set up those experiments and gathered those moon rocks for an incomparable two and a half hours, my patriotic pride and adolescent adrenaline were both maxed out. We had, after all, beaten the Russians. But perhaps it is worth noting that the Armstrong biography and its attendant film are not about the race to the moon in general, or geopolitics, or even American can-do grit, as in Ron Howard’s 1995 classic “Apollo 13,” about a lunar voyage that barely escaped tragedy. “First Man” is about the man. The book is about the man; the movie is about the man. The chapter of the book that addresses the moonwalk contains no dramatic, profound mention of the moment that has sparked the current fuss. Shall we now savage its history-professor author as a Russian spy? Hansen’s account does share details that take us directly into the nuts and bolts of the moment. The flag was designed to be pulled taut, but the support arm did not extend enough, giving the stars and stripes a permanent, wrinkly “wave” on the airless lunar surface; the lunar soil was so unyielding that there was concern the flag might topple; and while we have the iconic flag photo of Aldrin taken by Armstrong, there is no reciprocal flag photo of the actual first man on the moon, because as they prepared to take it, President Nixon called. I devoured these stories when the book came out thirteen years ago, and at no point did it remotely occur to me that the author had not made a big enough deal over the lump-in-the-throat moment of the flagpole striking the lunar dirt. Here’s what’s going on here: a Business Insider story last week by entertainment writer Travis Clark featured two facts with two words that proved incendiary: the flag-planting scene is “omitted,” and the Canadian star “defends” it. I’ll put my #MAGA jingoism up against anyone’s, but I actually examined what the story appears to be. To “omit” can mean to delete or cut, but it can also refer to a mere absence, as in “The Stones omitted ‘Brown Sugar’ from their setlist.” It doesn’t necessarily mean it was there and then axed; it might mean it was never there. In the case of “First Man,” the flag deployment was never there. But the fires were already lit among conservatives who have had it up to their eyeballs with Hollywood’s aversion to patriotism, a community of which I am a proud and vocal part. Throw in Ryan Gosling’s “defense”—that his portrayal of Neil Armstrong reflects a man who viewed his feat as a human accomplishment at least as much as an American one—and the barrage of posturing was instantly unrestrainable. All the right buttons are lit here—globalism that seeks to dilute American greatness, and a Hollywood culture that outright denies it. But in a headlong rush to hit mash those buttons, an overreacting throng misses or ignores the fact that Armstrong did indeed view this as an achievement of enormous value to the world and to humanity as a whole. I know because he told me. In October 2008 at the Frontiers of Flight Museum in Dallas, I moderated a panel observing the 40thanniversary of the first manned Apollo flight. I asked about the unique mantle he wore, featuring perhaps unequaled heroism and distinction. At every turn, he deflected attention from himself and toward the team that had put him there, reflecting at length about how he had spent the years since 1969 in gratitude that he was an initial chapter in what he hoped would follow, a story of mankind exploring among the stars. None of this obscures the American flavor of the story of Neil Armstrong, an Eagle Scout whose crew made sure the first craft to land on the moon carried the call sign of the bird that is our national emblem. 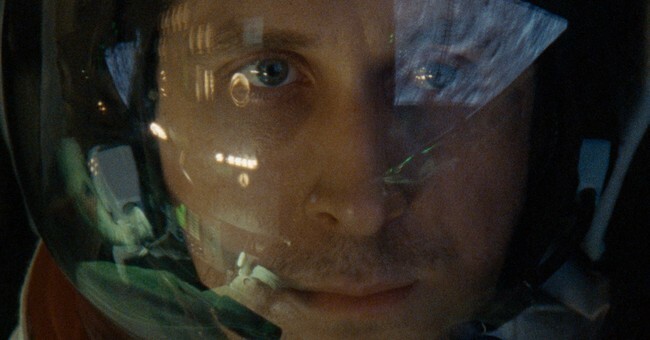 I steadfastly believe that if this story had not sent everybody off the ledge, that millions would have walked into “First Man” on its opening weekend in October, and virtually no one would have come out bellyaching that our nation and its flag had been impugned. Now we’ll never know, but here’s a crazy idea. How about if everybody shuts up about this until they’ve seen the movie? If, as the final credits roll, with no flashbacks to this week’s convulsions, everyone objectively feels as though our national triumph has been sullied by a dismissive Canadian director and star, then at least those views will be based on honest experience. I’ll bet that doesn’t happen.